This charm was the most fiercely guarded secret of the ancient world. According to legend, anyone who possessed this mystic charm was said to experience an unbroken chain of success. Now this powerful mystical force is available to you. The 7 points of the Mystic Star radiate a mysterious and intense energy said to bestow the Seven Treasures of the Kings – Wealth, Happiness, Love, Luck, Wisdom, Respect, and Glory. The moment you receive the Mystic Star you may feel its phenomenal force. As you touch it, its power may pour into you, and within days there could be profound effects. 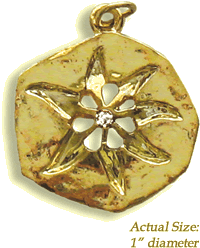 The Mystic Star, coated in 14-karat gold, has been widely recognized for its stunning beauty as well as its powerful mystical force. I live alone and am drawing a social security check which does not cover everything–especially during the winter months. I was broke, not a dollar in my pocket, no groceries, and I was almost out of Butane for the heater. Anyway, I received the Mystic Star on January 24th. Well, let me tell you. First, the church put Butane in my tank. Then on February 12th, I received two checks–one for $771 and one for $152. I am very pleased with the Mystic Star. The Mystic Star amulet works. For the past couple of days I believe that my life has been changing and I know that each day it continues to get better. I’m definitely buying more amulets soon. I received the Mystic Star as a gift and immediately I felt its power. My relationship got better, my financial got better, they gave me more hours at work + over time. I was definitely tired but my paycheck was great. Unfortunately sometime I misplaced my mystic star and things went downhill. I bought myself the Samadhi and a new Mystic Star, and gave it to my husband. He said his work is treating him much better!